Sean Kelly, CEO of Red Rock Secured, was born and raised in Denver, Colorado and received his Bachelor degree in Business Administration from Sonoma State College. From there he began working for PPI in the Chicago Board of Trade. 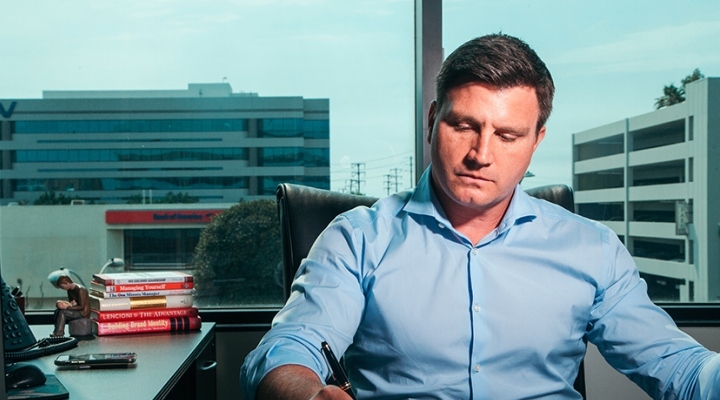 After the market crash in 2008, Sean Kelly formed Red Rock Secured in El Segundo, California to help clients protect their retirement accounts from being at risk in a market correction. Ten years later, his company has a 90 percent retention rate and has received an A+ rating with the Better Business Bureau, and a AAA rating with the business consumer alliance and has been accredited by Consumer Affairs. Red Rock Secured employs almost 50 staff members and affiliates, a tremendous growth from their start of 13 employees in 2017. This year they are launching their new home delivery retirement account option where Red Rock Secured can have the metals delivered to the client’s doorstep. Sean Kelly is thrilled to be celebrating the 10 year anniversary of Red Rock Secured with his wife and three children, whom he takes to the beach as much as possible. I was working for a company called PPI. It was at the Chicago Board of Trade, which had offices in Chicago and Los Angeles back in 2007 and 2008. After the 2008 market crash experience and witnessing half the country lose 40% of their net worth, I looked for a solution in regards to protecting retirement accounts in a place they’d be safe. What we found was people can do tax-free, penalty-free transfers of their IRAs and their 401(k)s into physical gold and silver. We also discovered that when markets go down, gold and silver typically go up. We decided to create a company in 2009 that focused on protecting retirement accounts, as opposed to having them out there at risk in a market correction, with physical assets that can never go to zero. As a wholesaler, we’re able to purchase millions of dollars of physical gold and silver every year. We’re able to capture wholesale pricing through the U.S. Mint, the Canadian Royal Mint, and the British Royal Mint, purchasing these assets at market value. We’re then able to pass those savings on to our clients and still make money between the wholesale and retail value. It took about seven months for us to become profitable. We’re very blessed in that regard. It was also a little bit of luck because we entered the market at a time where our products were very extracted in the current economic situation. In the beginning, there was doubt, but to rid myself of it, I hired the right people for the job instead of trying to do everything myself. At first, I tried to take on marketing myself with zero marketing experience in my business administration background and I quickly realized why people go to college for many years to learn marketing and branding. We were losing money in that sector, so we hired the best possible people to take over and run those departments. That’s when things really turned around quickly for Red Rock Secured. It was a family friend. He heard that we were starting a gold and silver company and he’d been buying gold for many years. His son wanted to purchase gold and silver, he made it a point to make sure that he was our first customer. We have many actually, but the one I think of off the top of my head is Google AdWords. What’s great about Google and their AdWords platform is we can make sure that when people are online searching for our solutions, we’re able to be right there in front of them when they type in gold IRA, how do I purchase gold, or how do I protect my retirement with gold. We are prioritized so they see Red Rock Secured as an option when someone searches that criteria. The toughest decision that is coming to mind is accepting applications from someone with experience versus someone who has all the potential in the world but hasn’t been given an opportunity to be successful in this industry yet. We’re really blessed in that we haven’t had to advertise for employment; we’ve been over inundated with applications and resumes coming in. So many times, we’ll get applications from seasoned veterans that are well known in the industry and have a great resume and history, but we’ll also have a resume of someone who may not have a lot of experience but comes from a different industry or maybe is out of college and haven’t been given a shot yet. It’s difficult at times to decide, do I go with the individual that’s completely new, that doesn’t have any bad habits but doesn’t have any good habits either and then we have to train them up from scratch, or do we bring in someone who’s a little bit more seasoned? What we really decided is to kind of scale our company in the same way you would a professional sports team. We try to aggressively pursue the best free agents out there, but also make sure we draft really well in the rookie class. My inspiration. I’m inspired by my children. Most people would say I’m a pretty motivated individual, but if I ever feel a lack in motivation, I always find it again when I look at my children because I know that we’re trying to build a better future for them. There have been so many. Almost every day I wake up and I get an email that one of our clients went out of their way to write a great review about us on the better business bureau. Or when we see one of our new executives close their first deal and get their first client and we get to see that spark in their eye because all their training and hard work has paid off. There are just so many satisfying moments. I suppose the most satisfying is when a client goes out of their way to go online and write a positive review about us. That always feels great and it seems like I see one every day, if not every other day. But also seeing our employees here succeed, that’s also very satisfying. This year here at Red Rock Secured we are launching the gold TSP and home delivery gold IRA option where we can have the metals delivered to our client’s doorstep. I’m really excited about Red Rock Secured becoming a household name. Any book that has been written by Patrick Lencioni. My favorite would probably be his book, Ideal Team Player because everything that we have implemented concerning our company culture being successful can be found in these pages. We recently had RRAD custom software built for Red Rock Secured. What this does is tie the front sales department back into the wholesale purchasing division, so that everything is now automated in real time. We also recently purchased a custom coded automatic Red Rock IRA application. Depending on the type of transfer a client does, there can be up to 30 to 40 pages involved and a lot of that information is redundant. What this new application does is it takes those 30 to 40 pages and reduces them down to just three or four pages and auto fills their information for them. The client no longer has to keep repeatedly writing their name, address, date of birth, and social security number on four or five different pages. What is the ideal experience for a client interested in joining Red Rock Secured? I think the ideal experience typically comes down to two things: why they should and how they should. If a potential customer is debating on why they should, they would call and speak to an executive and the executive would go over what their objectives are and what they’re trying to accomplish. Usually, their objectives are protecting their retirement account, being able to facilitate assets that cannot go to zero or having assets that will protect their retirement account from a market correction. We’ve seen that when markets go down, typically precious metals go up, and if the client feels that those objectives match up with why they should do this and it makes sense to them, then the conversation should move into how to do it. It’s actually a very simple process and we make sure to communicate how it works. Once they understand how, we do all the heavy lifting for them. We assist them with a couple of pages of paperwork and then within a week or two, they receive a call from us that their account is funded. We then go over placing the right precious metals in the retirement account that matches up with what they were trying to accomplish. At the end of the day, it’s being able to wake up when the market is crashing and knowing that their retirement account is safe in physical assets that can’t go to zero. It’s sleeping better at night knowing they’re safe. The best parts of my job are that there are never problems, only solutions, that I get to see employees develop and have success, and I get to see and hear that we’ve been able to help clients protect their retirement accounts in their stage of their life.